452 pages | 9 B/W Illus. 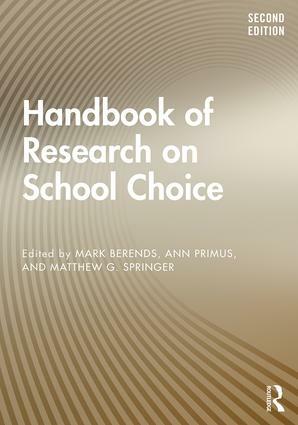 Updated to reflect the latest developments and increasing scope of school-based options, the second edition of the Handbook of Research on School Choice makes readily available the most rigorous and policy-relevant research on K-12 school choice. This comprehensive research handbook begins with scholarly overviews that explore historical, political, economic, legal, methodological, and international perspectives on school choice. In the following sections, experts examine the research and current state of common forms of school choice: charter schools, school vouchers, and magnet schools. The concluding section brings together perspectives on other key topics such as accountability, tax credit scholarships, parent decision-making, and marginalized students. With empirical perspectives on all aspects of this evolving sphere of education, this is a critical resource for researchers, faculty, and students interested in education policy, the politics of education, and educational leadership. Mark Berends is Professor of Sociology and Director of the Center for Research on Educational Opportunity at the University of Notre Dame, USA. Ann Primus is Associate Director of the Education, Schooling, and Society program at the University of Notre Dame, USA. Matthew G. Springer is Robena and Walter E. Hussman, Jr. Distinguished Professor of Education Reform and Associate Professor of Education, Evaluation, and Policy at the University of North Carolina – Chapel Hill, USA.